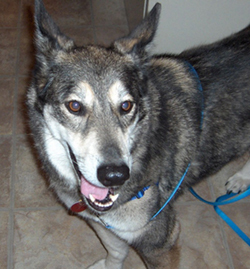 Kaia is a gorgeous spayed female Shepherd/Malamute mix who kept escaping from her owne's home so she was relinquished. She loves people, is fine with cats and was fostered with them as well. She ignores other dogs but would be happiest as an only dog as she prefers people over anyone. She needs some leash work and refined obedience work, but she has the basic sit and down commands under her belt. She needs a fenced in yard. She is too large for most children and we would prefer someone who has previously trained large breed dogs and who is familiar with the northern breed characteristics. She is spayed and up to date on vaccines. 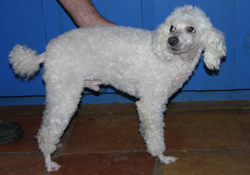 Oscar is a three to three to four year old neutered male mini (10 lb) poodle who is a delight. He is great with dogs, kids and probably cats as he loves people and will ignore the other pets just because he wants to be a lap dog. He is a real love and an easy dog as he is quiet and house trained. He's a real love who is going to be someone's world. We just have to figure out who that is. He is the sweetest dog and already groomed for you!